It was either that or "Jack of All Trades." Be glad I made the Universal Soldier reference, your day is now better. Now for something on topic.. When I first started renovating my home I needed tools. I knew a lot about tools, or so I thought. I bought tools upon tools each for its own specific purpose. A sliding compound miter saw for cutting all those complicated miter cuts, a set of pneumatic nail guns and a compressor, some beater chisels, mostly tools to slam and jam studs together to make walls. I soon had a garage full of rough carpentry tools, but when I went to build my first piece of real furniture or do some detail work on the house I found that I didn't have the proper control over the tools at my disposal. It was a bit like using a bulldozer to open a bag of peanuts...which I have done, and let me tell you not a peanut survived. This is the point in the tale when I discovered an entire alternate universe of carpentry. 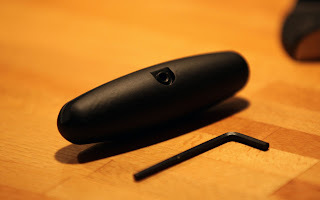 After a ton of research (one of my favorite pastimes) I had a pretty good list of new tools to help me venture down this path of finish carpentry and furniture construction. Now I just needed to learn how to use them and sell a kidney to pay for them. Fortunately, there is a large network of woodworkers out there with DVDs and Youtube videos on using and purchasing these tools. 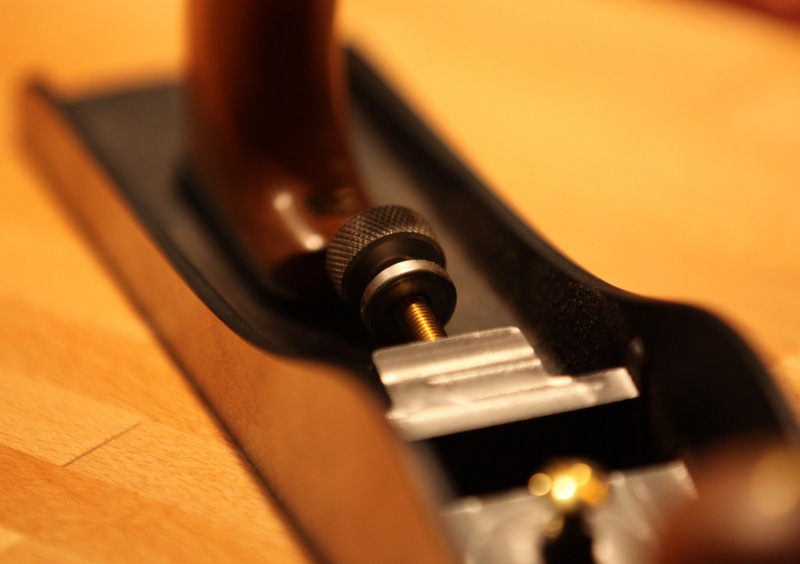 I was still awash in a sea of fine tool merchants until I decided to go to a Lie Nielsen Handtool Event. Here you can see the tools, hold them in your hands, and as an added sales technique they actually let you use them! 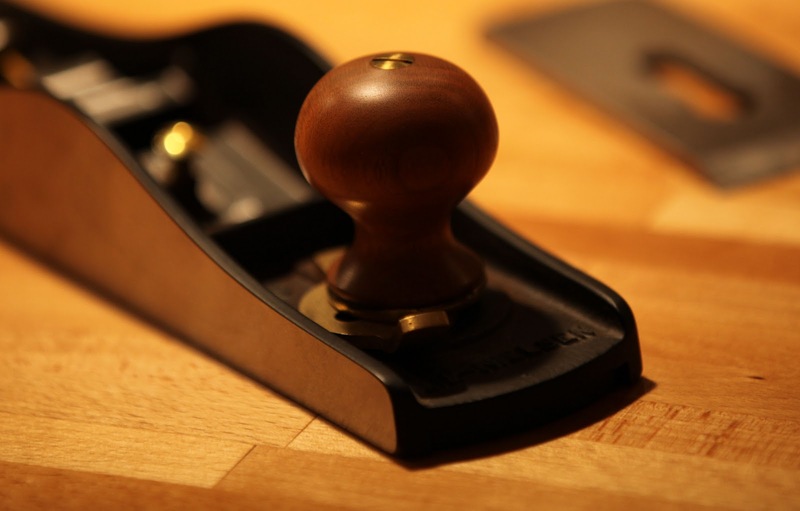 Let me interject at this point that I know there are tons of awesome tool makers out there. 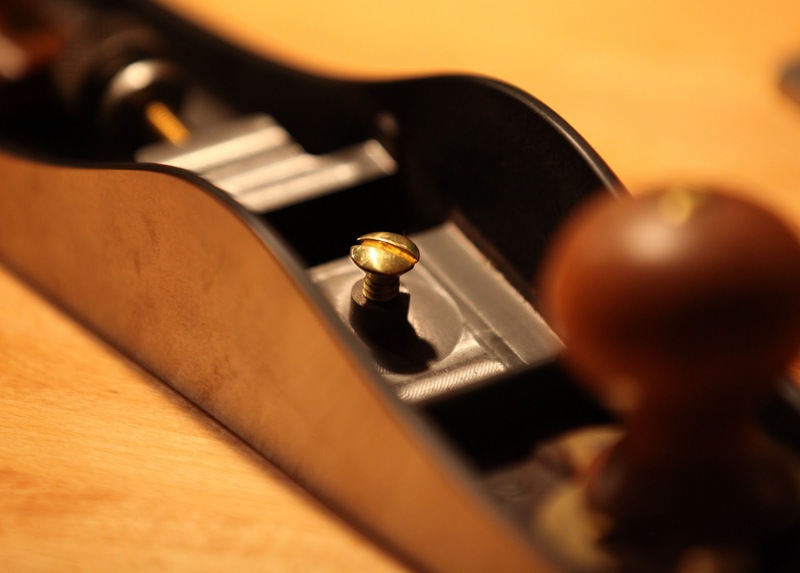 I would love to own something from Daed Toolworks, or anything made by Holtey Classic Handplanes (even just a sandwich) but Lie Nielsen produces a high quality tool with a "ready to use" finish that was in my price range. I spoke with Denb Puchalski from Lie Nielsen on which plane I should start with. 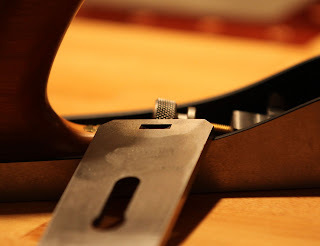 We discussed what I would be using the tool for, and he recommended the Low Angle Jack Plane based on the Stanley #62. Well, let me tell you this thing is a workhorse. The LN #62 is long enough to do some quick jointing, will quickly clear off lots of material with it's toothed iron, eats end grain for breakfast, and with it's 90 deg blade will even work like a scraper plane. I ordered the Low Angle Jack Plane Set which comes with a toothed blade, a 50 deg blade, and a 90 deg blade. It also comes with this neat leather wallet for keeping plane irons in, a hot dot attachment (which I'll get into in a minute), the all so valuable plane sock, and an instructional DVD. Out of the box the plane cuts beautifully, I gave the regular blade a super quick hone and waxed the sole and it cut like a hot knife through foie gras. I felt like I had entered some other realm of woodworking once I used a plane that was properly fit and finished. Using this plane also helped me fettle some other antique planes properly so they could perform their intended task, instead of being used as paperweights. The front bun is cherry and loosens to allow you to slide the mouth open and closed with the use of a brass lever. The adjustment knob at the rear is stout and knurled just enough to grab. You can see in the photo below how the iron sits on a heavy washer which rides the threads of the adjustment knob to move the iron in and out of the throat (taking a lighter or heavier cut). Below you can see the Frog and cap screw on which the blade rests. It is sturdy and heavy, coupled with the extra thick blade, chatter is basically non-existent. The body is ductile iron so it is heavy which is a benefit for me in that it helps me feel the weight of the tool against the wood being planed. This way any resistance from grain tear-out is felt immediately. 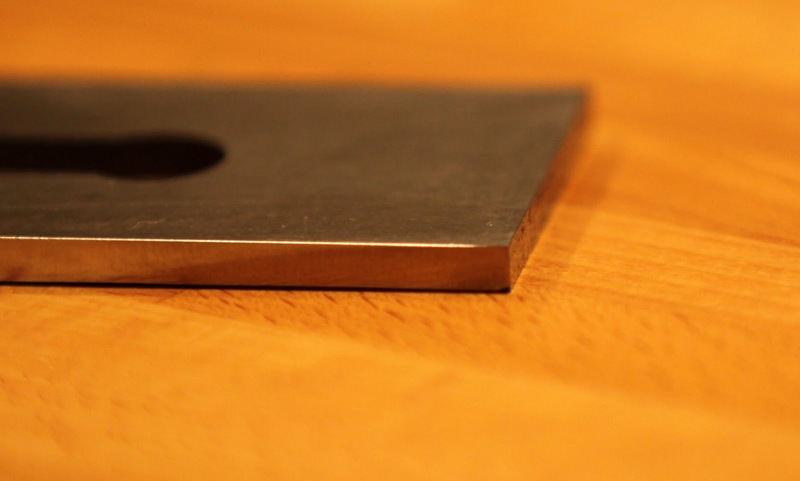 The frog is set at 12 degrees and when the 50 degree blade is placed on it (bevel up) it results in a 62 degree angle which is excellent for a range of lumber species. 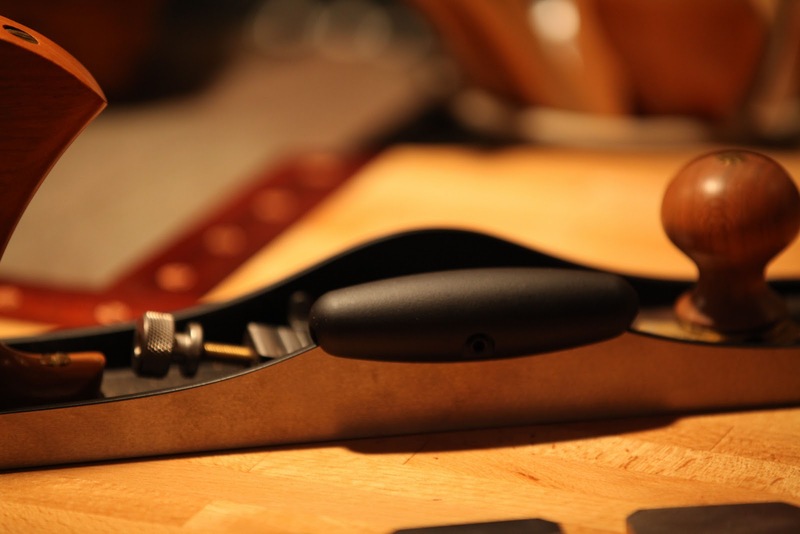 The toothed plane iron is excellent at quickly removing material and working with difficult grain. I just finished using it to plane down some bubinga for a saw handle that had some wonky grain and it had zero issues. 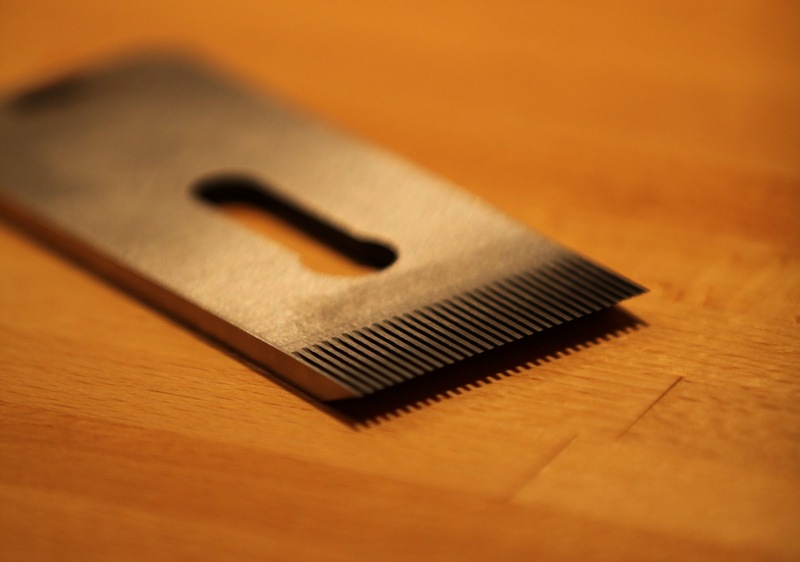 The teeth are 0.03" wide and are spaced at 0.03" so the marks they leave on a board face can be easily cleaned with a smoothing plane or even with the 50 deg blade that comes with this plane. The 90 degree blade is really interesting, it works great as a scraper blade but I was very skeptical when I first received the plane. It actually does work which is great because I really wasn't sure how I would justify a scraper plane to my wife after purchasing this baby. Finally, the hot dog attachment. It basically is just a bolt on handle for use with a shooting board. It gives you the ability to hold onto the side of the plane without putting your fingers near the business end of the blade. This is good for cleaning up end grain and jointing small boards. Lie Nielsen has plans for a shooting board on their website here, Shooting Board Plans. This plane is a great "multitool." It performs a variety of tasks and only eats up one spot on my shelf. The fit and finish are great and it'd be a great addition to any tool arsenal. Two thumbs and a hot dog up.